Sad to say, Saturday’s Boston Globe featured this front-page probituary of Boston jazz impresario Fred Taylor. 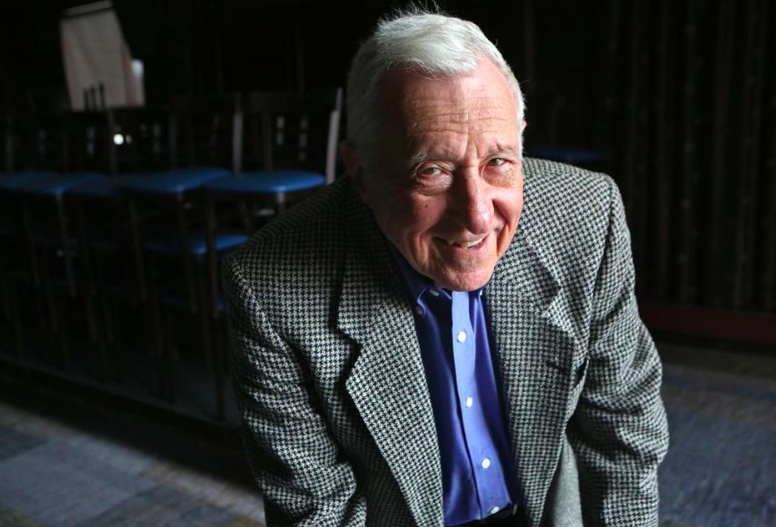 Fred Taylor, a legendary figure on the Boston jazz scene since the 1950s, has been abruptly fired as entertainment director at Scullers Jazz Club, angering local jazz fans and signaling a changing of the guard at the well-known music venue. Taylor, whose acts at the club included Lou Rawls, Wynton Marsalis, and Norah Jones, had presided at Scullers since shortly after it opened 27 years ago at the DoubleTree Guest Suites Hotel. He e-mailed friends this week to say he’d been let go by the hotel’s management. A fixture on the Boston jazz scene for several decades, Taylor, now in his 80s, is perhaps best known as the former owner of the storied jazz clubs Paul’s Mall and the Jazz Workshop on Boylston Street, where he booked such luminaries as Duke Ellington, Miles Davis, John Coltrane, Stan Getz, Charles Mingus, and George Benson. 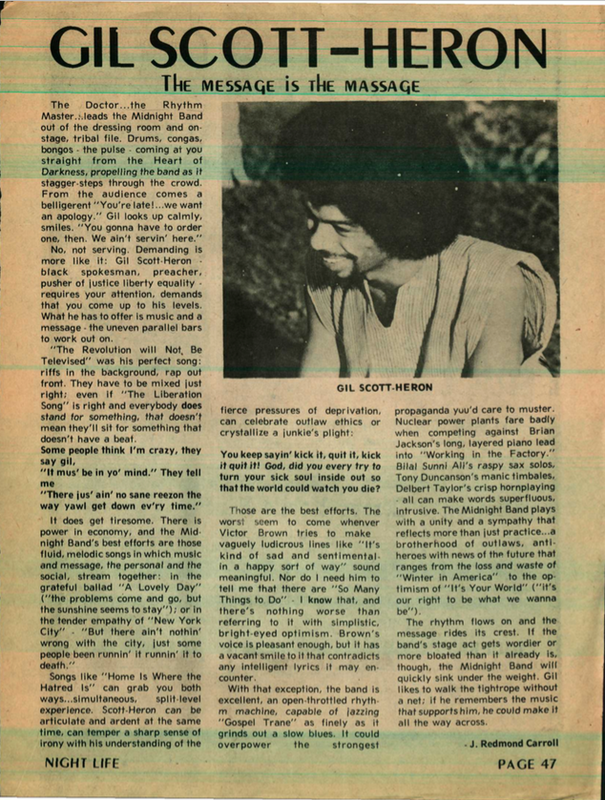 And, quite memorably, Gil Scott-Heron in 1976. Forty years ago, I was a minor league Boston music critic, writing (under multiple bylines from J. Redmond Carroll and John Redmond to J.R. Tardi) for local B music publications including – but not limited to – Musician’s Guide, Nightfall, NightLife, PopTop, and Rock Around the World. In the summer of 1976 (‘Bicentennial Fever Grips Hub’ – even Little Stevie’s House of Pizza redecorated in red white and blue), I saw two of Gil Scott-Heron’s three performances at Paul’s Mall during Fourth of July week. Both times – and in fact every time I got into Paul’s Mall or the Jazz Workshop in those days – I had to talk my way through Fred Taylor, who was tough, dismissive, and, ultimately, soft-hearted toward anyone who loved jazz. Memo to Fred: Here’s what you got for your kindness 40 years ago. Admittedly, I was still writing with training wheels back then, but I think the lede holds up okay. Anyway, here’s “The Bottle” from that great gig. Thank you, Fred Taylor, for so often letting me into your home where the jazz was. This entry was posted in Uncategorized and tagged Bicentennial Blues, Boston Globe, Charles Mingus, Duke Ellington, Fred Taylor, George Benson, Home Is Where the Hatred Is, It's Your World, Jazz Workshop, John Coltrane, Keith Jarrett, Little Stevie's House of Pizza, Miles Davis, Musician's Guide, Nightfall, Nightlife, Paul's Mall, PopTop, probituary, Rock Around the World, Scullers Jazz Club, Stan Getz, The Bottle. Bookmark the permalink. Thanks, Howard. Hope all’s well.